If you recall, I had my own list of reading goals that I wanted to accomplish before the end of the year. Then along came The Fall Reading Challenge and I thought I might as well incorporate my goals with the carnival. 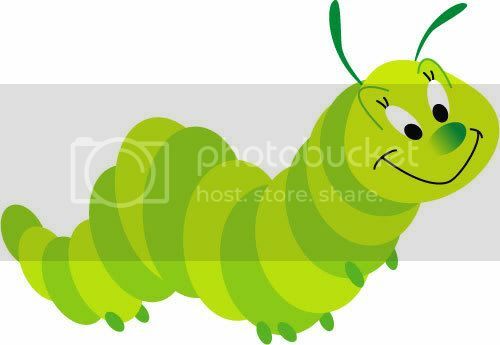 So here I am! I'm looking forward to seeing what other people are purposing to accomplish in the next few months. Without further ado - this is what I'm setting out to read . . . I'm reading Jane Eyre along with countless others (I am sure) for 5 Minutes for Books Classics Carnival. Be sure to stay tuned to 5 Minutes for Books for upcoming carnival activity. 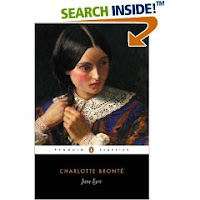 The date for everyone to link their Jane Eyre thoughts and reviews up is Tuesday, October 7th. I feel much more passionately about this book than last month's Pride & Prejudice. Probably because I had never read Jane Eyre before; I had only seen the movie. I also hope to have finished Wives & Daughters by the end of September. This book came highly recommended by my friend Sarah at Library Hospital so I feel compelled to read it. It's thick. It's intimidating. But since she liked it I will read it. If I survive it (and the month of September for that matter!) then it's on to October . . . . 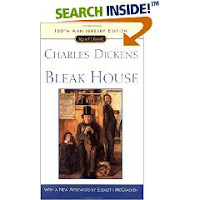 In October I plan on reading Bleak House, again because of Sarah. However, this time I'm planning on reading it WITH Sarah. The two of us are going to team up and cheer each other on. I hate Dickens so this is a mighty big stretch for me. However, Calon Lan said she was glad she read it and she doesn't much care for Dickens either so I have hope. Another non-blogging friend of mine is also reading this book so I will have plenty of brains to pick as I move along. Because I don't like Dickens I need to give myself something to enjoy and delight in. Who better than Nancy Moser? I've read both of her other books in this series (Washington's Lady and Just Jane) and liked them both so I'm eager to get at this one. It'll be a respite in the midst of my Dickens storm, I'm certain. The Faerie Queen, by Edmund Spence. I have been assured by some that I will be utterly delighted and thrilled. I have been warned by others that I am risking an early earthly demise by reading this book. I assure you I do not know what I am getting into. The only thing I know is that Anne (of Green Gables) loved this book and out of love for Anne I am willing to see what it's all about. Provided I can tell what it's all about. Wish me luck . . . or something. Again, because of the mass volume of my other Pick of the Month, I'm allowing myself some downtime with Nancy Moser. I'll also be reading Time Lottery. I have no idea what it's about. I just know it's by Moser and I'd like to finish the Moser books I have sitting on my shelf by the end of the year so that I can move on to something else at the beginning of next year. 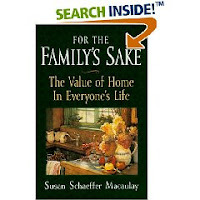 For the Family's Sake: The Value of Home in Everyone's Life, by Susan Schaeffer Macaulay, which was recommended to me by my non-blogging friend. It looks fantastic. I just got my hands on a copy so I'm all set and ready to go wherein that book is concerned. I love books on home making but haven't picked any up in awhile. But I have a good friend and resource who provided me with a list of books that should keep me busy for some time. Yay! Lastly, I'm reading Comstock Lode, by none other than Louis L'Amour and Leepike Ridge, by N.D. Wilson along with my online bookclub, Bookfest. And that, my friends, should keep me PLENTY busy, me thinks! I'm looking forward to it! Thank you, Katrina at Callapidder Days for hosting this marvelous carnival. I'm sure it'll be tons of fun. I'm glad for this because I frequently get so caught up in reviewing things for 5 Minutes for Books (which I totally love doing, btw!) that I don't make time to read things just for me. So this is good. Now back to the books . 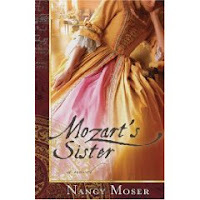 . .
mozart's sister is wonderful! i love nancy moser's books. i'm reading her new one now, it's a contemporary but it's really good. I just read Jane Eyre several months ago and it is one of my all-time favorites. Several of these are ones I want to read some time, too. Mt TBR list is growing ever longer! Wives & Daughters is soooo GOOD! Thanks for sharing your list. How can someone reach you reagrding somehting of interest to fans of Louis L'Amour? How can someone reach you with something that may be of interest reagrding Louis L'Amour? I'm not sure if I've commented on your blog before, but I come visit quite often and enjoy reading your reviews. 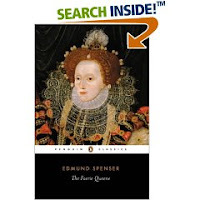 I'm hoping to read some of the Fairie Queene in the near future,too. I plan on using the Canon Press publication- Fierce Wars and Faithful Loves, Book One. Here's an excerpt from the back cover: Despite all of his acknowledged greatness, almost no one reads Spenser anymore. Roy Maynard takes the first book, exploring the concept of Holiness with the character of the Redcross Knight, and makes Spenser accessible again. He does this not by dumbing it down, but by deftly modernizing the spelling, explaining the obscurities in clever asides, and cueing the reader toward the right response. Just thought you might like to check it out - as I'm thinking it may be a good way to get introduced. AHHHHHHHHHHHH Sherry -- THANKS! I'm a HUGE fan of Canon Press (attended Wilson's church when I lived in Moscow) and so I'd find that an excellent resource. I hadn't heard of that book so...yay and THANKS! Floating away . . . I'm so glad you decided to join Fall Into Reading '08! Enjoy your books! Ooohhh, The Faerie Queen. The one book assigned in college that I did not finish (but still wrote the paper). It might be worth another try. I will be interested to know what you think. What a great list. I'm loving Jane Eyre too, and had never read it (despite the fact I thought I had) and didn't know there was a movie version, so it's all new to me! You have some terrific and ambitious choices here. I think Wives and Daughters is very under-rated, myself. I signed up for this challenge, too. Looks like a great list you have there!